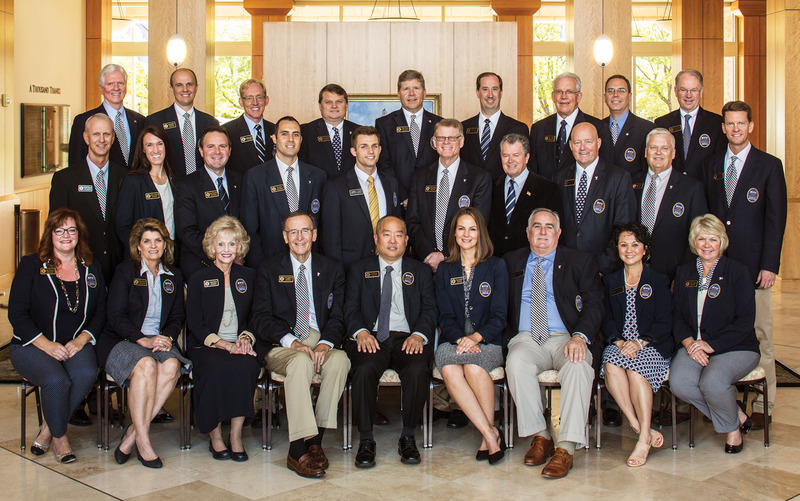 Pictured here is the BYU Alumni Board, tasked with extending the blessings of BYU and connecting alumni. Back row (from left): Morris D. Linton (BA ’74, JD ’78), Garth R. Black (BS ’00, MBA ’08), Jonathan O. Hafen (BA ’88, JD ’91), Peter N. Richards (BS ’83), Mark J. Wiest (BA ’82, MBA ’85), Stephen L. Whyte (BA ’97, MPA ’04), Lynn V. Ogden, Scott R. Eckern (MFA ’83), and Michael B. Knudsen (BA ’86, JD ’89). Middle row: Robbie Bosco (BA ’86, MA ’90), Alicia Anderson (BS ’08), Bryan J. Hardman (BS ’93), Tauailoto Ioane (BA ’05, MPA ’08), Cragun C. Liston (’18), Robert N. Gentry (BS ’71, MEd ’75), Paul R. Warner (BS ’65, MREd ’68, EdD ’74), Kenneth L. Hunt (BS ’78, JD ’80), Greg J. Drennan (BS ’85), and Paul D. Hansen (BS ’84, MBA ’88). Front row: Jane Eddy Densley, Karen Bybee (BA ’81), Cindy Hardy Snow (BS ’71, MS ’96), President Terry R. Seamons (BS ’64, MS ’66, PhD ’72), Executive Director Keith A. A. Lue (BS ’86), President-Elect Amy Kunz Fennegan (BA ’94), Michael J. O’Connor (BA ’89), Susan Gavos Hunter (BA ’88), and Joan Gabrielsen Morris (BS ’80). Not pictured: Steven L. Elder (BS ’96, MAcc ’96) and Sean D. Reyes (BA ’94).